As many of my friends do, I like to bake banana cakes as a good way of getting rid of ripe bananas, and treating my family with some good desserts without wasting anything. Amongst all kinds of cakes, I like the light, fluffy chiffon cakes the most. The texture of this banana chiffon cake is a bit like the kind of Japanese cake, different from this one. Even though I eat half of this cake, my stomach still can have room for a big meal afterwards. The Chinese translation of “chiffon” is “戚風” that says it all. The cake is really light as “wind” literally. Not only is this banana chiffon cake so easy, and quick to bake, but also do I love the banana fragrance coming out from the hot oven while baking it in this cool weather. Preheat oven to 165C (330F). Use a small food processor to process the bananas into paste. Set aside. Mix the egg yolks with 14 grams of sugar until smooth. Add oil, milk and mashed bananas. Combine very well. Sift in cake flour, incorporate all ingredients well until you get a smooth batter. Fold in the egg whites into the batter. Add one third of egg whites at a time in order to easily incorporate the egg whites (Also, here’s a video of showing how to fold-in the egg whites). Transfer the batter into the cake mould that shouldn’t be non-stick or greased. (The mould you use is very important to get the best result. It helps the cake avoid from shrinking too much after removing from the oven, once the temperature drops.) Pop in the preheated oven and bake for 55 to 60 minutes. Test it by an inserted needle coming out clean. Remove from oven and immediately revert the cake mould upside down on a wire rack. Let it cool completely. Carefully remove from the cake mould. Enjoy! My type of cake...airy and smooth! I have been seeing chiffon cake posts lately. Always love typical Asian cakes, because of the moistness and softness. Such a beautiful and fluffy dessert - I thought I had seen all sort of chiffon flavours but it is my first time to see a banana version - lovely. What a nice change from the typical dense banana bread. I bet this cake is so nice and light and fluffy. Oh! 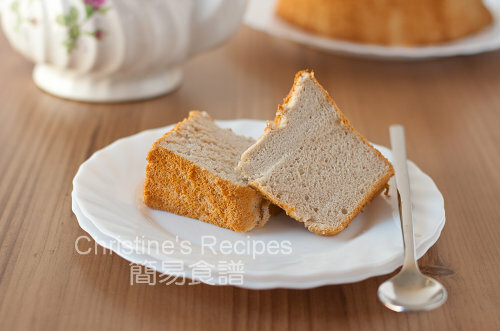 Banana chiffon cake...I must try this one since we always have banana :-) Looks yummie! Beautiful and light cakes are my favourites. Fingers cross that I can make this! What a light and delightful cake. Your family is so lucky to have you bake wonderful treats for them. I made this yesterday =] And it was very light and fluffy and delicious! I found the cake to be more moist than my usual chiffon cake recipe- is this supposed to be the case?? But then the bannanas I used were actually off, and I didn't realise that until I had a slice and then my mum chucked it into the bin so I don't have any photos for a blog post =[ But thanks for the recipe anyways! I'll probably be making this again when we buy more bananas! It's because of the ripe banana puree. Leave the baked cake for a few more minutes in the oven after it's done. It's dry up a bit and not so moist. Does this recipe have chinesse version one??? The Chinese version of this recipe is here, only the picture is different because I've done that again and posted here. The only cake tins I found in Brisbane are all non-stick. Do you know what I can do to make the cake rise higher. They all shrink once it comes out of the oven. But awesome cake ~ I LOVE IT!! I happened to see some chiffon cake tins, not non-stick ones, at Robin's Kitchen. They are a bit bigger than this recipe yields for though. But you can increase all the ingredients in proportion if you get one from Robin's Kitchen. Or you can ask your friends to buy you one from Hong Kong. I've looked in the supermarket, they don't sell cake flour, is it OK to use plain flour? Check with Asian grocery stores. They should have cake flour. You can't get the soft texture as expected if you use plain flour. I need to work on cup and spoon measurements. Can you please tell me how much flour, sugar, milk and oil to add in terms of cups. hello! the cake looks sooo good! i would like to know if i could double the bananas (i.e. 4 instead of 2) without doubling the entire recipe? would the cake end up too moist/too heavy? Yes, I would think it could be too heavy if you add 4 bananas. The texture would be too moist. Not too good for a chiffon cake. yes, in the end i simply doubled the recipe. the cake was good, though i felt it was a little too moist and the banana flavour wasn't strong enough. is there any way to make the banana flavour stronger, other than adding banana flavouring? 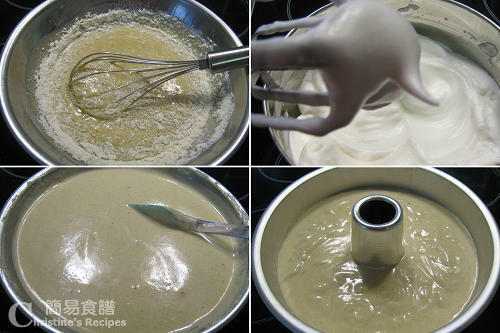 You can't add too much bananas into the batter, the chiffon would be too moist, not light otherwise. If you really like more banana flavours, I guess the only way is to add a few drops of banana essence. I made this cake today but it didn't turn out as good. It sank to a flatter cake after I removed from oven. Any idea how I could improve on it? Also, I was wondering if your bananas at 240g is including skin? The fluffy texture or how it looks after removing from oven depends on how well the egg whites are beaten, and how well they are folded in the batter. Take a look at the video I posted, it might give you some idea. The link is on the sidebar. The banana skin was removed and weighted 240g. I just finished making this cake and it is probably the best banana cake I've ever made. But my cake didn't rise as high as the one in your picture and I added slightly more flour and 1/2 tsp of baking powder. Any improvements or insight of what went wrong? I just made this cake and it is probably the best banana cake I've ever made. But my cake didn't rise as high as yours in the picture. I used slightly more flour and 1/2 tsp of baking powder. Any insight of what went wrong? This chiffon cake only needs the beaten egg whites, no baking powder needed. The fluffy peaked egg whites would help the cake rise. Any added flour or baking powder would destroy the balance of ingredients. Hi Christine, I searched all over and I could only find a non-stick pan. Is that still okay for the cake though? Non-stick pan is not good for making chiffon cakes because the cakes will easily shrink back and collapse. Did you watch my video of how to beat egg whites? The beaten egg whites give the crucial support of a chiffon cake. I often add a bit of cream of tartar to stablize the egg whites, as the air inside the egg whites wouldn't be knocked out easily while folding. And the heat of oven is very important too. If the temperature of oven is not hot enough, the cake won't rise high. Having said that, don't let your cake get brown too quickly. Note that if a cake gets brown within the first 10 to 15 minustes, it indicates the oven temperature is too high. Both temperature and time of cooking work hand in hand together. I also found non-stick cake pan is not quite suitable for baking chiffon cakes. The chiffon cake would easily shrink back. The loose base, with a tube, not non-stick, shown in my picture is the best. Try to get one if you really want to bake best chiffon cakes. One more thing, don't ever grease the pan. Seems that your cake might be too heavy, or contained too much moist, so it fell off once turned up side down. Probably, the egg whites were not beaten/folded in properly. Thanks for this great recipe. I made it on the weekend and it turned out fabulously. I used a removable base baking tin, then remove the cake with a very sharp knife with a saw blade. If the cake is baked properly, it's very spongy, you can press the sides with hand lightly, the cake could be seperated from the tin bottom. Thanks! I did need to use a knife to run the cake off the side. So it's normal to have a bit of cake batter stuck on the tin after you remove it? I live in New York. I'm having trouble finding the right Cake Flour. Can I use all-purpose flour instead? Will it still be as light and fluffy, if I use something else other than Cake Flour? Please help! Cake flour is a kind of low-protein flour. You can replace it with 4 parts of all-purpose flour and 1 part of corn flour/cornstarch. For example, 80 grams of cake flour, you might try using 64 grams all-purpose flour and 16 grams of corn flour instead. See how it goes. Oh. I overlooked your message before. I got it! Cornstarch is just as good! Thank you very much Christine! You are very responsive! I can't wait to make it this weekend. As I didn't have cream of tar tar, I replaced it with light sour cream and realized no matter how long I beat the egg whites it just never become foam and fluffy like :( it came out watery. Could the reason be because of the sour cream? It was the sour cream that caused the egg whites not beaten fluffy. If you didn't have cream of tartar, you can use freshly grated lemon juice, about 2 teaspoons. You might try adding 2 to 3 tablespoon of cocoa powder, depending on how strong the choc taste you like, into the batter. 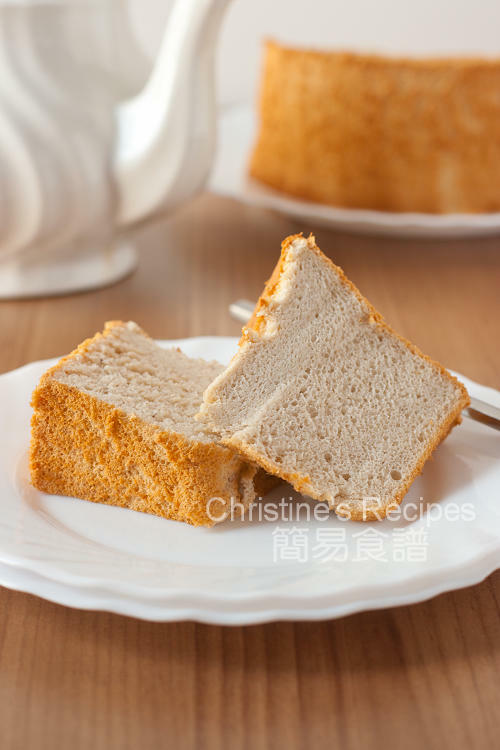 Hi Christine, I love your banana chiffon cake receipe. I tried yesterday and my son love it. Wonder how I can adjust the ingredient to make a cocoa chiffon cake? You might try to use this green tea chiffon cake recipe for reference, and replace the green tea powder with cocoa powder. It's much easier.